When people set out to begin a major work project or adopt a healthier lifestyle, it’s easy to become discouraged when picturing the long road ahead. By the same token, even smaller-scale plans like keeping a medical appointment or a standing date to the gym can become easily derailed by the busyness of our daily lives or a simple aversion to the doctor or the treadmill. In a series of studies, Wharton operations and information management professor Katherine Milkman finds that there are relatively simple steps that people can take to help themselves —or their employees or relatives —to stick to their plans and adopt behaviors that are better for overall well-being. The papers are “The Fresh Start Effect” and “Put Your Imperfections Behind You: Why and How Meaningful Temporal Landmarks Motivate Aspirational Behavior,” co-authored with Wharton Ph.D. student Hengchen Dai and visiting professor Jason Riis; “Holding the Hunger Games Hostage at the Gym,” co-authored with Wharton health care management professor Kevin Volpp and Harvard professor Julia Minson, and “Using Implementation Intentions Prompts to Enhance Influenza Vaccination Rates,” co-authored with Yale professor James J. Choi and Harvard professors John Beshears, David Laibson and Brigitte C. Madrian. In this conversation with Knowledge@Wharton, Milkman describes her findings and how people can put them into practice. My research looks at how people can overcome temptation and how they can achieve their goals, particularly in the domain of health. So how people can do things like exercise more, eat healthier food and make and keep medical appointments that they know are in their long-term best interest. The first study I wanted to mention to you is one I did to look at the power of planning prompts, or prompting people to form a plan about exactly when they’ll follow through on and engage in a good behavior, like getting a flu shot or a colonoscopy. 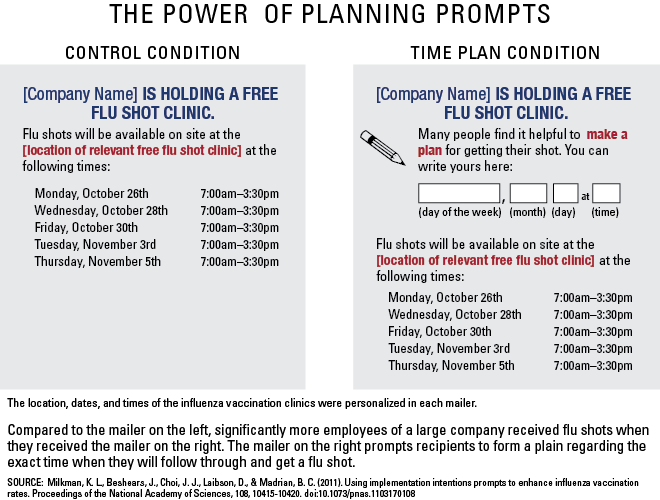 We found that when people are prompted to just write down the date and time when they will get a flu shot, we see dramatically higher rates of follow through. This also works with colonoscopies. I have another study that I really like that looks at the power of fresh starts. What do I mean by a fresh start? Well, there are moments in our lives that feel like the start of a new era, the start of a new cycle, like the beginning of a new week, the beginning of a new month, the beginning of a new year, following a holiday or following a birthday. Twitter And following those kinds of fresh start moments people actually are more motivated to follow through on their goals. We see that people search more for the term “diet” on Google [during those times]. We see that people go to the gym more frequently following those fresh start moments. And we also see that they create more goals, both health-related and health irrelevant goals on a goal setting website. A third study that I think is representative of this line of work looks at an idea I called temptation bundling. The idea is simple: Imagine that you really struggle to go to the gym. You don’t have the willpower at the end of a long day. And imagine you also have a thing for a trashy TV show, let’s say Breaking Bad. You feel a little guilty about watching Breaking Bad when you should be doing other things. So how do you solve these two problems? What if you only let yourself watch Breaking Bad while you were exercising at the gym? You would stop wasting time at home watching this TV show that you feel guilty about and you would start craving trips to the gym at the end of a long day to see what happens in the next episode. Not only that, you will enjoy your workout and your Breaking Bad episode more combined because you won’t feel guilty watching that episode. And time will fly while you’re exercising at the gym. The key takeaways are a number of tools that you can use to try to help yourself or help others follow through on their goals. One key takeaway is that whenever you want to help somebody follow through on a goal, one thing you should do is actually prompt them to think about exactly when and where and how they will accomplish that goal. By prompting them to think through those things, even if they do it privately and don’t ever tell you their plans, you can help them reduce the likelihood that they will actually forget to follow through because now there is this cue embedded in their memory that is going to trigger the recollection, “Oh, this is when I’m supposed to … this is the moment I said I’d do it. This is when I’m supposed to go to the gym.” It also makes it harder for them to procrastinate because now they’re putting off something they explicitly said they’d do, rather than kind of a vague intention. So planning prompts are one way people can really help one another increase goal follow through. Another practical implication of my work is that it suggests that you may want to encourage people to follow through on their goals at fresh start moments. If you’re thinking about when [to remind an] employee about an objective that he or she wanted to meet, for instance, the best time may be after a fresh start. So at the beginning of a new week, month, year, following a birthday, a work anniversary or even at a moment you could frame to them as a fresh start for some reason. It’s the start of a new project, for your team, for instance. So those are a couple of practical implications. Temptation bundling suggests that you can encourage people to bundle their temptations with things that they know they should do. For instance, as we talked about earlier, bundling an engaging audio novel, say, or a TV show with exercise. Or you could only allow yourself to, say, get a pedicure when catching up on overdue work. Or to watch your favorite TV show at home when catching up on some household chores or listening to your favorite music while catching up on chores. One thing I found really surprising was how huge the demand was in a study I ran for temptation bundling. In this study we asked participants if they would be willing to pay us to take away a possession they could otherwise use freely— an iPod we’d given them as a gift, that was preloaded with a tempting audio novel of their choice— and lock this possession they could otherwise use freely at the gym so they could only access it when working out. We thought that not that many people will find it attractive to pay us to take away something they could otherwise use whenever they wanted. And, in fact, more than 60% of our participants said, “Oh, sign me up, that sounds great.” And they wanted to give us money in order to take away this tempting possession so it could help them exercise more. So that was one really interesting, I thought, and surprising and exciting finding. I have another one that’s kind of funny. My other surprising finding is actually in the research I did on fresh starts, also in a study looking at gym attendance. What we found in that study, one of many things we found in that study, is that people are more likely to go to the gym in the months following a birthday than in the months preceding it – so, following this fresh start event. Now interestingly, that’s true for every birthday that was in our data set except one notable birthday— the 21st birthday. When we first found this, we were a little surprised and then pretty quickly we realized maybe there is a reason for that. That’s not so bizarre after all. But that was something that stuck out at us as interesting in our findings. One thing that organizations could do is simply use planning prompts whenever they want to encourage follow through on a good behavior. They could prompt people to think through the where, when and how of engaging in that behavior. Another thing they could do is try to provide tools to facilitate temptation bundling. For instance, at their gyms they could offer to have a subscription available to Netflix that you could log into and watch your favorite show, and pick up where you left off. Or they could hold your iPod in a locker for you so that you could pick up listening to your favorite audio novel where you left off on your previous visit. I think one of the main misperceptions these studies dispel is that there’s not a lot you can do if you are, say, overweight or in debt or haven’t achieved the educational goals that you hoped to achieve. What these studies say is that there are, indeed, tools you can use and strategies you can employ and that your friends can actually help you with as well …to help motivate you to achieve your goals. A lot of this research that I’ve done …is actually really new. No one had ever looked at fresh starts before, so that’s sort of wildly new. No one had ever looked at this idea of temptation bundling. The one set of studies that overlap a little bit more with past work are the studies on planning prompts. People had looked at the power of planning prompts in the past, but what sets our work apart is two things. One, a lot of past studies involving planning prompts actually involved face to face contact or contact over the phone with someone who asked you to walk through a plan. And what we actually did is sent a simple mailing. You never interact with another person. You’re simply prompted to write down the date and time when you plan to engage in a given behavior. There is no social pressure that might be increasing the power of the planning prompt, and we still see huge benefits. One of the things that we do is isolate the fact that it’s not something about social pressure, it’s just the act of forming a plan privately that can really increase follow through. We also do that study with a very large, real population—thousands of people looking at real flu shots, whereas a lot of past studies have looked at hypotheticals or self reports. I’m doing a lot of research right now looking at other ways we can encourage people to follow through on their goals and overcome temptation. One study that I’m particularly excited about is a large field experiment looking at encouraging people to save more for retirement. We have about 30,000 people, and in our experiment we’re encouraging them all to sign up to take money out of their paycheck and send it to their 401(k). Some people are offered the opportunity to do that, to start having the money …at a fresh start moment — so say, following a birthday or following the New Year — whereas other people are also offered the opportunity to do it in the future, but at a fairly arbitrary date. And what we’re hoping is that our hypothesis will be confirmed, which is that people will be more motivated to save and enroll in these retirement savings programs following fresh start dates, and that that will be a strategy that can then be employed more widely. Recent Wharton research shows that the key to engaging in healthier behavior may be tying tempting activities -- like reading an escapist novel -- to things we know we should be doing. While the new year is a popular time to make a fresh start at work or at home, Wharton experts say there are a number of techniques people can employ throughout the year to successfully change direction.